Modernity, sustainability and deconstruction; these are the roots of Christopher Raeburn’s MCM capsule collection, debuted in an installation which took place on Saturday in Holborn’s historic Grand Connaught Rooms. The paradox is that MCM is a company with a long history – founded in Munich in 1976, this year it’s celebrating its 40th anniversary. So, when tasked with creating new ideas that stayed true to this heritage, Raeburn did what he does best. He deconstructed. 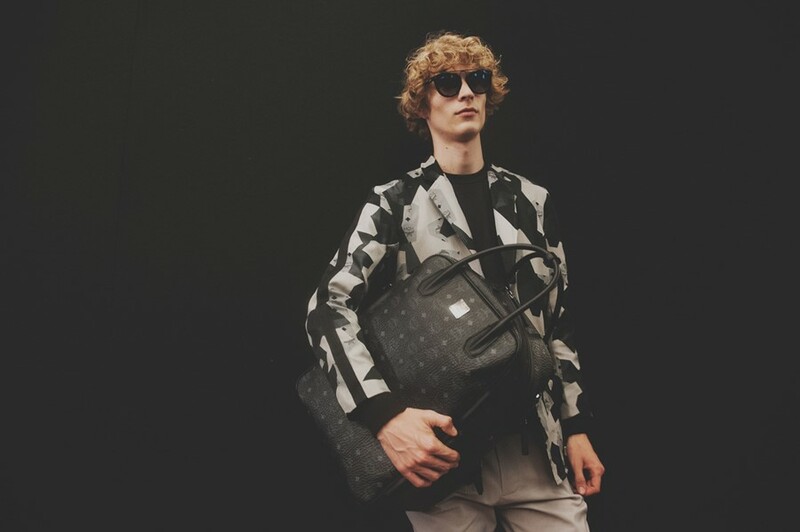 The designer literally dismantled MCM’s famous logo backpacks, working them into a slick biker jacket that still retained the bags’ original zips and fastenings. This piece then acted as a catalyst for the collection’s remaining pieces; “it’s a step-by-step process of one thing going into the other,” he shared backstage. “There’s really a story behind everything – I think that’s super important.” Other nods to the brand’s heritage were less literal; the dominant colour palette of grey, blue and yellow was a subtle tribute to the colours of the Bavarian flag, whereas a series of t-shirts and sweatshirts were adorned with an abstract ‘MCM’ print which mimicked the motion of wind. Incidentally, motion was another key theme that ran throughout the collection. Both Raeburn and MCM were united in their desire to create clothing and accessories which would appeal to the 21st-century adventurer – they did so by revamping the company’s famous travel accessories, presenting a new customisable 3-in-1 bag designed to tackle even the most dire of travel emergencies. Raeburn also riffed on the power of nature, incorporating elements such as wind and water into an immersive installation created in collaboration with Universal Everything. Models interacted with the presentation, marching in a uniform fashion to the centre of a transparent 360-degree screen; digital images were superimposed over it, creating the impression that the models really were battling the elements. The designer stayed true to his reputation as a forward-thinking designer with regards to sustainability. One fabric used throughout the production of the collection was made from recycled bottles; another scratch-resistant, dirt-repellent four-way stretch material was used to create a resilient bomber jacket that neither damages the environment nor exploits foreign labour. Raeburn feels passionately about sustainability, arguing backstage that designers have a real obligation as a design community to provide people with better choices. As he put it – “It’s not about standing on a soapbox and telling people to think and buy sustainably, it’s about providing people with a product where you’ve already done the thinking and you’ve already had that considered approach to it.” That was certainly the case here.